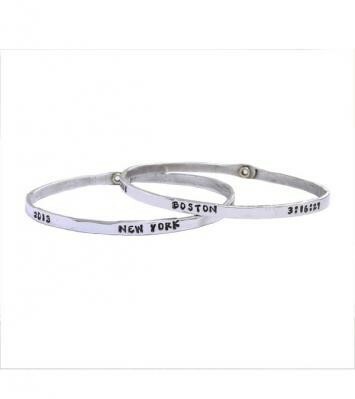 "Runner's Jewelry, Personalized Stacking Bangle Bracelet Silver"
Collect a Runner's Bangle for each race you finish! Stack them all to show your accomplishments in style! Create your own customized bangle with the race, date and your time - or whatever information would be special to you. Celebrate your achievements in classic style with our simple stamped silver runner's bangle. Stack them up and show off each marathon or half marathon, the year, and your time. Each runners bangle will be stamped three times. We can allow for 12 characters/spaces per stamp. The stamps will be equally spaced around the runners bracelet. We suggest putting the location of the race, the date and the time but you can customize the piece however you want!